A place away from city not very far; relaxing as well as challenging; in the lap of nature with modern amenities; equally attractive for both young and old, kids and parents...! Around 250kms from Delhi on the bank of River Ganga lies this place called Shivpuri. 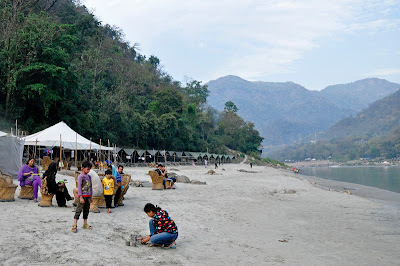 Stay in luxury tents, sit leisurely on the banks of river Ganga enjoying the cool breeze, open your stiff tired limbs and play volley ball or badminton, swim around, take a forest walk, involve yourself in adventure sports like kayaking, rafting, rock climbing etc in the day and relax with a can of beer, guitar and amazing nature around bonfire at night. I recently visited Shivpuri, it's my third visit. I wonder how the place has changed itself as per the demand. My first visit was with my office colleagues and it was a corporate trip. Shivpuri then was a secluded place, the main attraction then to visit the place was Rafting. And you would mostly find adventure sport lovers visiting the place and staying in tents that provided the basic facilities. My second visit was with family and friends after around 5 years. I realized the scenario there has changed much. Number of tents in the area have considerably increased and so have the facilities in the tents. The first time I visited this place, the loos were a small pit in the sand in contrast to what I see today. Now they have English style comod with proper flushing system. People come to take a break from their hectic life in city and relax on the bank of Ganga while staying comfortably. Rafting is an option for those looking for some adventure too. My third visit left me totally surprised... I was amazed to see how this secluded peaceful place has changed into a picnic spot. Families from all around north India have flooded the place. And why not, the place has everything that a good weekend getaway should have. I would not call a trip to Shivpuri an adventure travel as most of travel agencies sell it... I would rather say its luxury travel that provides you the opportunity/ option to engage in some adventure sport as well. Tented accommodations have all facilities... Comfortable bed to sleep on, wonderful river view in front, jungle and nature so near, loos with all facilities including hot water for bathing and perfect wholesome meals. If you looking for a place to relax and you also like adventure sports, you'll love the place. There's a lot to do - Kayaking, River rafting, Rock climbing, Jungle walks, Trekking. Feel like taking a break and visiting Shivpuri? Contact me @9999731115.